Itty bitty Briceland has been the stage for a mini- drama over a tiny nursery next to a wee bus stop for small people. A local farmer, who asked not to be named, is throwing up his hands in frustration over the statute in the county's cannabis ordinance that prohibits outdoor cultivation within 600 feet of a school bus stop. 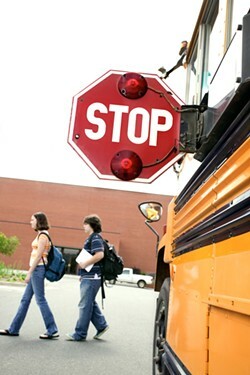 Suggestions to the Southern Humboldt School District's transportation director, Karl Terrell, that the bus stop be moved up the street, were met with denial. "I didn't move it," Terrell said. "It's a safe spot where it is. That bus stop has been there 35 years. Am I supposed to move bus stops every time someone wants to have a grow?" Many folks trying to get legal have expressed annoyance with the morass of regulations governing the application and permitting process. Steve Lazar, head of the county's cannabis services division, said a few applicants have run into issues with the school bus stop guidelines, which apply to outdoor grows and dispensaries but not indoor nurseries. Legal grows, nurseries and dispensaries are not allowed within 600 feet of schools. Terrell says there are active grows (although probably not legal ones) well within 600 feet of local schools, and that the smell often wafts across the playground. "I think we're going to continue to have these things come up," said Terrell, adding that he had trouble recruiting enough school bus drivers because they were tempted away by higher pay in the marijuana industry. "Things keep evolving." As Humboldt County continues to chase down how legalization will impact its resources and culture, Oakland-based Hound Labs is trying to build a better mousetrap, so to speak. The company recently announced that it has created the "world's first dual marijuana and alcohol breathalyzer to detect and measure recent marijuana and alcohol use on the breath." Properly identifying stoned drivers has been a challenge for law enforcement for some time, as states where recreational cannabis has been legalized have reported an increase in traffic accidents involving the drug. Field sobriety tests usually rely on officers smelling cannabis or observing behavior consistent with impairment, then running a blood test. But because tetrahydrocannabinol metabolites, uniquely, store in the body's fat cells, a blood test for a habitual users might show evidence of use even if they are not stoned at the time of testing. Hound Labs says its device just had a successful pilot test and will be available for sale to law enforcement agencies around this time next year. But not so fast, says Scientific American, employing a truckload of puns to make the point that, due to the tolerance of some users, there might not be a way to measure THC intoxication. "As cannabis wafts back into mainstream America on growing winds of legal change ... ," SA contributor David Downs opens the article. Stay in your lane, Downs. Meanwhile, in New Mexico, a state advisory board voted to add "opiate use disorder" to that state's Medical Cannabis Program. New Mexico has had one of the country's highest rates of drug overdose deaths, with 536 people dying of overdoses in 2014. Patient advocates, addiction specialists and state lawmakers all lent their support to the decision, which is now in the hands of the New Mexico Department of Health. Should the state decide to go with the advisory board's recommendations, medical marijuana could be used as a tool to combat opiate addiction, bringing the Land of Enchantment to the forefront in the harm reduction model of addiction treatment.